Stilettos a staple in your wardrobe? Think twice before wearing high heels. While the stiletto is a staple in many women’s wardrobe, wearing high-heels may put you at risk for Morton’s neuroma, a nerve condition that can induce pain in the foot described as “crippling, sharp and burning”. In fact, a new study shows that women are 8-10 times more likely to develop Morton’s neuroma compared to men – and the blame is placed on the height of their heels. This particular study, presented at the Royal College of Surgeons of Edinburgh, revealed that women ages 40-69 exhibited an increase in hospital admissions due to Morton’s neuroma and that the rate of these women receiving treatment for the condition rose by more than 50% over a 10 year period. Further, half of these women were prescribed surgery to alleviate the very painful symptoms. While this might not completely change your mind about the height of your heel, take a moment to learn about Morton’s neuroma and the effects of this condition on your feet. What is Morton’s neuroma? Morton’s neuroma is a thickening of nerve tissue that occurs between the toes, most commonly the third and fourth. The enlargement of the nerve tissue that defines a neuroma is the result of compression and irritation of that nerve which can eventually lead to permanent damage. Though young and middle-aged women are most commonly affected, anyone can develop a neuroma, particularly athletes, like sprinters, who put a lot of emphasis on the ball of their foot. However, one of the most common offenders is wearing shoes that have a tapered toe box, or high-heeled shoes that cause the toes to be forced into the toe box. What are the symptoms of Morton’s neuroma? Symptoms begin gradually and at first only occur occasionally when performing certain activities that will aggravate the neuroma. Symptoms can include tingling, burning or numbness, and pain. It has been described as feeling “as if you are standing on a pebble in your shoe or your sock is bunched up”. These may go away temporarily, but overtime can progressively worsen, persisting for days, weeks and even years. If you are not properly diagnosed and treated, the symptoms become more intense as the neuroma enlarges and the changes to the nerve become permanent. How is Morton’s neuroma diagnosed? Neuromas are a common ailment seen by podiatrists, foot and ankle specialists and the diagnosis for Morton’s neuroma is typically straightforward because of the description of the sharp, shooting pain and numbness in the toes. However, because the patients' descriptions of the pain can vary or because the pain could be related to another injury, ultrasound and MRI have proved to be a useful tool for confirmed diagnosis. An x-ray study will not show a Morton’s neuroma, but may be necessary to exclude other conditions or diagnosis. MRI, because of its superior contrast resolution and reproducibility, is often the preferred imaging modality for confirming a diagnosis of Morton’s neuroma. Shields MRI recommends the use of a high-field 1.5T MRI machine for diagnosis and in some cases, the use of gadolinium. Gadolinium is a contast agent that, when injected into the body, makes certain tissues, abnormalties or disease processes more clearly visible on an MRI scan. 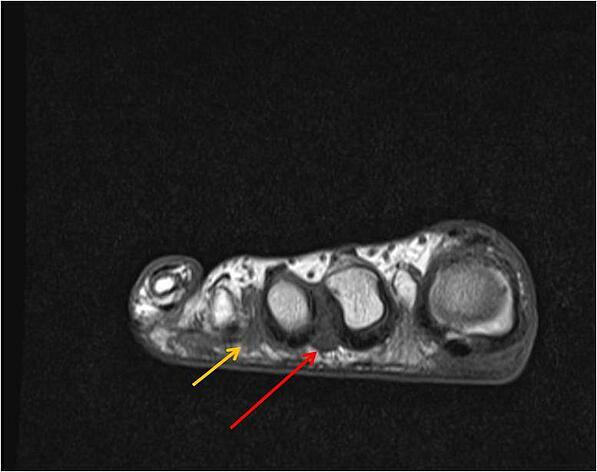 In the image below, Shields MRI’s radiologist was able to diagnosis the patient’s Morton’s neuroma without the aid of gadolinium, but did recommend it in the final diagnosis to further identify another potential Morton’s neuroma on the image. Morton’s neuroma MRI case. Shields MRI cared for this patient, a 63 year old female, who complained of pain and a lump in between her second and third toes. Her symptoms were present for about three years and she had previously had surgery from bunions. Her podiatrist questioned that she may have Morton’s neuroma. This patient has a nodule consistent with Morton’s neuroma where her pain occurred – between the second and third toes (red arrow). She also has a potential smaller Morton’s neuroma between the third and fourth toes. The diagnosis was made on the Morton’s neuroma between the second and third toes, but it was recommended that if a more detailed evaluation was desired by her physician, that a contrast-enhanced study be considered. What are treatment options? Treatment options vary and would not be recommended by Shields MRI or your radiologist. The goal of the MRI is to properly diagnose the Morton’s neuroma; the patient than returns to their physician who recommended the MRI for proper treatment path. In developing a treatment plan, your doctor may recommend non-surgical options such as: padding, icing, custom orthotic devices, activity modifications, shoe modifications, NSAID medications or injections such as cortisone, local anesthetics or other agents. Surgery may be suggested or a combination of non-surgical treatments may be pursued first and then surgery if a patient doesn’t respond adequately. Surgery may be considered in patients who have not responded adequately to non-surgical treatments. Regardless of your treatment plan, you will be given instructions on appropriate footwear and modified activities to reduce the pressure on your foot and neuroma.